Home prices across the U.S. rose in October, but at a slower rate than in September, according to the S&P/Case-Shiller Home Price Indices released Tuesday. 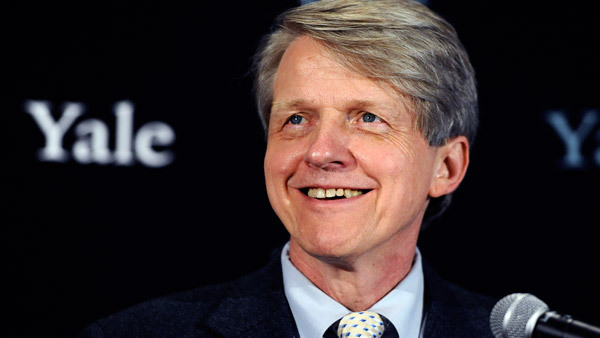 Robert Shiller, one of the developers of the S&P/Case-Shiller indexes. The 10-City Composite gained 4.4% year over year in October, down from 4.7% in September, while the 20-City Composite gained 4.5%, compared with a 4.8% gain in September. Eight cities, however, did experience faster price rises, data showed. The S&P/Case-Shiller U.S. National Home Price Index, which covers all nine U.S. census divisions, saw an annual gain of 4.6% in October, versus 4.8% in September. Over the last 12 months, Miami and San Francisco experienced price rises of 9.5% and 9.1%, according to the report. Las Vegas led the declining annual returns with a decrease of 1.2%. The National and Composite Indices were both slightly negative in October — the 10- and 20-City Composites were down by 0.1% from September and the National Index by 0.2%. Eight cities saw prices rise faster October than a month earlier, while 10 cities recorded lower monthly figures and two — Detroit and San Diego — were flat for the month. San Francisco and Tampa, Florida, led all cities in October with increases of 0.8%. Other cities that experienced increases were Dallas, Denver, Las Vegas, Los Angeles, Miami and Phoenix. Chicago and Cleveland were the big losers, reporting decreases of 1% and 0.7%. “After a long period when home prices rose, but at a slower pace with each passing month, we are seeing hints that prices could end 2014 on a strong note and accelerate into 2015,” David Blitzer, managing director and chairman of the index committee at S&P Dow Jones Indices, said in a statement. “Two months ago [August], all 20 cities were experiencing weakening annual price increases. Last month [September], 18 experienced weakness. This time, 12 cities had weaker annual price growth, but eight saw the pace of price gains pick up. Blitzer noted that most national economic statistics, other than those connected to housing, had posted positive reports in November and early December: third-quarter GDP was revised to 5% real growth at annual rates, and unemployment was at 5.8%. In contrast, housing was somber, he said. In November, housing starts declined by 1.6%, existing home sales were down 6.1% and new home sales were down by 1.6%. — Check out Top 10 Affordable Housing Markets for Millennials on ThinkAdvisor.